Lake Baikal has been chosen to host one of the world’s largest telescopes. Russian scientists hope it will help unravel the mysteries of dark matter in the center of the Milky Way. Six years from now, a giant telescope constructed inside the world’s deepest freshwater lake will peer into the depths of our universe to reveal – scientists hope – the mysteries of dark matter, a mysterious substance believed to account for 23% of the mass-energy density of the observable universe. For now, testing has just been completed on the optical modules used to build the device. The telescope in Siberia will look into the very centre of our galaxy, where there is a massive black hole from which neutrinos, very tiny particles generated as a result of different atomic reactions in the dark matter of black holes that carry unique information, can reach Earth. It is believed that a large part of the universe is comprised of dark matter, but its existence has only been proven in theory. If Russian scientists manage to “catch” a piece of it, this would be one of the major breakthroughs in physics in the 21st century. While scientists have known about the existence of neutrinos since the 1930s, it is only relatively recently that they have been able to “catch” them. Russian physicist Pavel Cherenkov discovered that these particles emit a slight blue glow when they pass through water or ice. This is why a body of water was selected as the site of the future telescope. “Catching neutrinos” is similar to panning for gold dust. Despite the enormous number of particles, only a few of them carry useful information. Alexander Avrorin, Chief Engineer of the Baikal Deepwater Neutrino Telescope Project, said “scientists are able only to pinpoint a few dozen truly unique particles a year.” It’s worth the cost, however, since scientists are confident that neutrinos travelling from the most distant corners of the universe could give signs about the structure of space and about events that occur in ours and other galaxies. 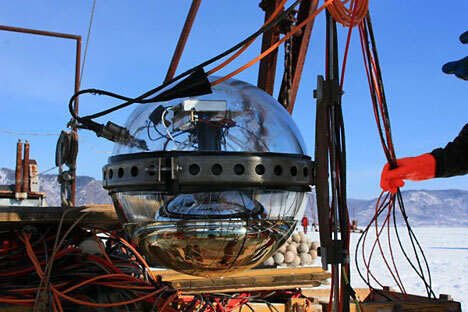 The old telescope modules, which were placed deep in Lake Baikal in the 1990s, were only able to record the neutrinos that originated in the Earth’s atmosphere. The new one will be 100 times larger and capable of capturing objects located much further away. The telescope’s shape is similar to a fisherman’s net. Transparent balls, which are optical modules that can withstand tremendous water pressure at a depth of 1.5 kilometres, are attached to a string like a huge bead necklace. Inside these devices are solar cells, which pinpoint the flash caused by the neutrinos and transfer this information over a fibre-optic cable to a research center located onshore. Work to install the new optical modules has already begun, although the project has faced some difficulties due to a lack of funds. Russia discontinued the production of photomultiplier tubes, an integral component of the module, because of the global financial crisis. Japan is the only other country that produces these expensive elements. “Even with imported components, the Russian telescope is still several times cheaper than its foreign analogues,” Avrorin said. This can be attributed to the unique natural conditions at Lake Baikal: it is frozen for half of the year. The ice is so thick that it can easily withstand the weight of the platform that is used to install the modules. Meanwhile foreign specialists have to install their equipment using deepwater bathyscaphes or by melting the ice at a depth of about two kilometres. There are two other facilities in the world that “catch” neutrinos. ANTARES, a joint project between France, the Netherlands, Russia, Spain and the United Kingdom, operates in the Mediterranean Sea, while specialists from the United States, Sweden and Germany have installed the AMANDA telescope in the ice of Antarctica. Igor Belolaptikov of the Russian Nuclear Research Institute said the telescope in the southern hemisphere can only look in one direction, while the universe’s most interesting objects are located in the area where the Baikal telescope will be directed.